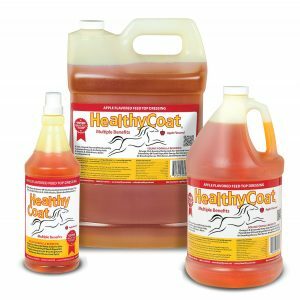 All-natural HealthyCoat liquid feed supplement is a highly digestible source of Omega 3 and 6 essential fatty acids, Vitamin E and Lecithin, fortified with Niacin, Biotin and Vitamin B12, with no artificial preservatives. Due to the lack of freshness and feed processing, the nutrients found in HealthyCoat are often lacking in a horse’s diet. These Omega 3 and 6 essential fatty acids cannot be produced by the horse and must come from the outside source. In HealthyCoat, the highest quality available Omega 3 and 6 essential fatty acids are preserved due to their unique mechanical extraction process. This method uses low temperatures and no chemicals. Obvious symptoms of fatty acid deficiency are dry skin, weak hooves, dull hair, lack of vitality, poor health or condition. HealthyCoat has been proven to promote optimum health and decrease fatty acid deficiency. University studies revealed this natural product improved horses’ aerobic intensity and extended their anaerobic threshold, necessary for highly demanding activities and competition. Muscle glycogen storage, which helped maintain muscle stamina, was significantly higher. Lactating and gestating mares also out-performed their counterparts. Safe, all-natural source of vitamins and lecithin. Shake gently, settling may occur. For top dressing grain, start gradually 1 to 4 oz. for average adult horse. With active horses or maximum response for difficult skin and coat needs you may feed up to 8 oz. Mechanically extracted soybean and flax seed oil, Lecithin, Niacin supplement, Biotin, Vitamin B12 supplement, natural and artificial apple flavors, mixed tocopherols (Vitamin E as a preservative). Vitamin E minimum 250 IU/lb. Vitamin B12 minimum 337 mcg/lb.